They have been rivals for decades, but unionized workers from South Korea’s two largest airlines, Korean Air Lines and Asiana Airlines, found themselves seeking the same goal over the weekend -- seeing their chairmen resign. Chanting a slogan against the power abuse of Korean Air Chairman Cho Yang-ho and Asiana Airlines Chairman Park Sam-koo, employees of the two airlines held a joint rally in front of Cheong Wa Dae on Saturday evening. 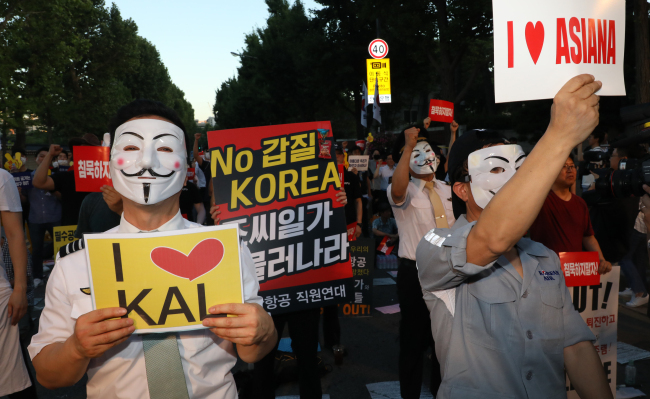 The joint rally, the first of its kind officially organized by the labor unions of the two, was attended by some 300 employees covering their faces with Guy Fawkes masks and sunglasses to avoid identification and retaliation. The employees of Asiana Airlines demanded Chairman Park resign, claiming he is responsible for “starving” passengers. Asiana, the second-largest air carrier, has faced criticism over its “no-meal” fiasco, which resulted in planes not serving in-flight meals. Criticism continued inside Asiana, following a video clip showing Asiana cabin attendants singing a song in praise of Chairman Park. The company was also accused of having appointed a foreign member -- a close friend of Chairman Park -- to its board of directors from 2004 to 2010, which goes against Korean aviation law. “I am part of the group of employees who want to see ourselves make change in this rotten company. We believe that employees’ collective action can teach the leadership what is right and just,” an Asiana Airlines employee told The Korea Herald, asking to remain anonymous. He has been working at Asiana for nearly five years. Korean Air employees already held two rallies of their own in early May, at which they denounced the chairman’s family for alleged abuses of power against workers. Earlier this year, his wife Lee Myung-hee and two daughters were called in by the prosecution over different allegations spanning from assault to smuggling luxury goods and illegal hiring of a foreign housekeeper. Korean Air Chairman Cho Yang-ho last month was investigated over his alleged embezzlement of company funds and inheritance tax evasion. “Through rounds of protest, what we want to say is that the employees in the flight industry have been the biggest victims of airline chaebol’s gapjil,” said an organizer of the joint rally on Saturday. “Gapjil” refers to a bullying toward someone under one’s control or influence. orders, it will also harm passengers’ safety,” the organizer added. Korean Air, the country’s biggest airline and flag carrier, was established in 1962 and dominated the airline business here until Asiana Airlines jumped into the commercial airline business in 1988. Rivalry has intensified since Asiana’s debut, to defend or gain market share in the fast-growing passenger aviation market here, thanks to the continued growth in income level and the popularity of overseas travel. The two rivals, along with their respective budget airlines, take nearly 90 percent of the local market. According to the Ministry of Trade, Infrastructure and Energy, Korean Air and its low-cost carrier brand Jin Air hold 58.1 percent of market share here, while Asiana Airlines and its LCC Air Busan and Air Seoul account for 30.3 percent. The continued woes of both companies, as well as intensifying protests by employees, will weigh heavily on their stocks, profits and even the reputation of Korean airline services, touted among the world’s best for years. “Since more rounds of rallies are planned from the labor unions, it will inevitably impact both company’s brand image and values. With the expansion of low-cost carriers as well as some passengers who have begun boycotting the brands, the two airlines can possibly see the number of their passengers drop,” said Park Joo-geun, head of CEO Score, a local corporate tracker. Prior to the “water rage” incident involving Cho’s youngest daughter, Korean Air shares stood at 35,900 won ($31.80) on April 11. But as of Friday, the shares were priced at 29,100 won, marking a 18.9 percent drop in value. According to Brandstock, a company that evaluates brand value, Korean Air slipped 25 notches from the first quarter and ranked No. 36 in the second quarter this year in terms of Brand Stock Top Index. BSTI is calculated based on stock value (70 percent) and consumer feedback (30 percent). Prior to the infamous “nut-rage” incident in December 2014 involving eldest daughter Cho Hyun-ah, Korean Air ranked sixth among Korea’s top 100 brands. “Considering that investigations into scandals involving the ownership family are ongoing, it won’t take long to see Korean Air’s brand value further fall. It will become harder for the company to recover in a short period of time,” said a Brandstock official. Business experts have predicted that Asiana Airlines will experience a severe drop in operating profit. Kim Young-ho, a Samsung Securities analyst, said the country’s second largest airline by revenue is expected to post 53.2 billion won of operating profit in the second quarter -- just one-fourth of the operating profit year-on-year.